The Nazis used the opening of the newly elected Reichstag (the elections having been held on March 5, 1933) to stage what Ian Kershaw has aptly described as a carefully orchestrated propaganda play. On the “Day of Potsdam,” they wanted to demonstrate not only the alleged unity of the nation but also the historical continuity between the Third Reich, Prussia, and the German Empire [Kaiserreich]. The opening of the Reichstag had originally been scheduled for the first week in April, but the date was moved up to March 21, the first day of spring and the anniversary of the opening of the first Reichstag in the German Empire (March 21, 1871). Additionally, the main festivities were moved from Berlin to the Potsdam Garrison Church, where Frederick II ("the Great') and his father, Frederick William I, were buried. Former crown prince William was present as a guest of honor and representative of the Hohenzollern dynasty, and his brothers Eitel Friedrich and Oskar (both members of the Steel Helmet [Stahlhelm] veterans’ organization) also took part in the “Day of Potsdam” celebrations together with a third brother, August William (an Oberführer in the SA). On that same day, members of the Nazi Party, the military, and the police held parades like those in Potsdam in other German cities. The population followed the main events in Potsdam on the radio and over public loudspeakers. The celebrations ended with torchlight processions in the evening and a performance of Richard Wagner’s opera Die Meistersinger von Nürnberg at the Berlin State Opera on Unter den Linden. Hitler was in attendance. 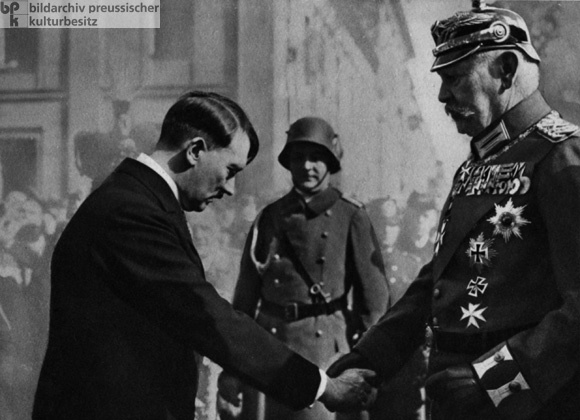 The photo shows Hitler bowing deferentially as he shakes hands with Reich President Paul von Hindenburg (right), who is dressed in the uniform of an imperial field marshal. Photo by Theodor Eisenhart.